Sure enough, as soon as you walk into the apartment, you feel immediately at home and positively energised by the decor. The Hoxton apartment was designed in collaboration with Camille Walala, a French artist known for her powerfully positive digital print. Her signature tribal pop style certainly puts a smile on your face and gives the apartment such a fresh feel. The master bedroom is large and spacious, with french doors onto the patio, plenty of storage space and a wondrous en suite bathroom. And Camille Walala's decor carries on through the whole apartment to the second bedroom which is also amply sized. Everywhere was spotlessly clean. The main bathroon is next to the second bathroom and is amply stocked with lovely Bamford products. The decor is all pulled together by the spacious and imposing hallway. The playful black stripes were all painted by hand and are a brilliant example of how to create a striking look without spending a lot of money. Hoxton itself has a vibrant arts and entertainment scene and has mostly shrugged off it's rough and ready image associated with it's past. 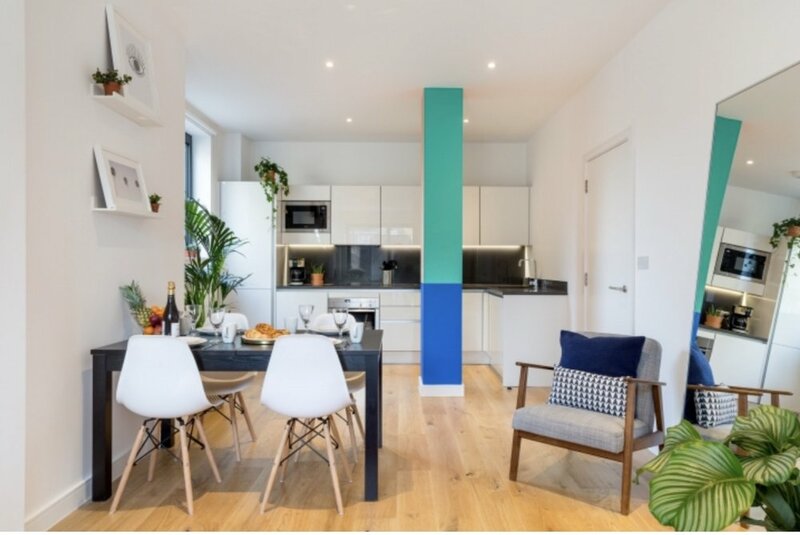 We loved staying at this Cuckooz apartment in Hoxton - it was beautifully decorated and furnished with everything you might need. The surrounding area is so interesting and well worth a visit in it's own right, or as a springboard into central London with it's excellent transport links. I'd stay here again in a heartbeat.